New Forest Stationers is an Independent High street retailer specialising in Stationery, Art & Crafts and Printing Services located on New Milton high street in the New Forest. Stationery – Our wide range of stationery brands include Maped Helix, Stabilo, Lamy, Zebra and Pilot just to name a few. We pride ourselves on getting great products at the best price for you, stocking everything from social to office stationery, diaries, calendars, high quality greetings cards, printer inks and more. Arts & Crafts – Downstairs at the back of the shop is our Arts & Crafts departent. Stocking well respected brands including Daler Rowney, Liquitex, Winsor & Newton and Faber-Castell we are sure we have something for everyone from the budding artist or crafter starting out, through to the professional. Our dedicated Arts & Craft staff members are always on hand to give advice and help you find what you are looking for. Printing Services – Upstairs is our printing department providing a wide range of printing, copying, binding and laminating services. So whether you need just one copy or a batch order, or maybe you would like to print your own design on invitations, whatever your printing needs give us a call or pop down and see us for more details. 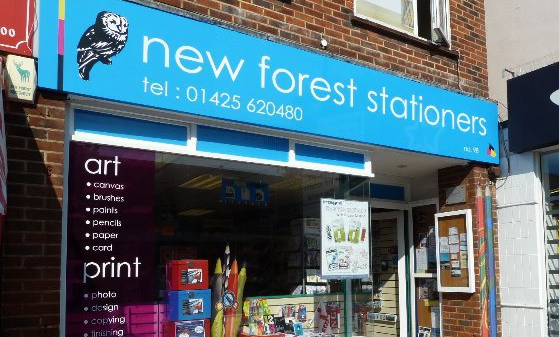 At New Forest Stationers we pride ourselves on providing great personal customer service and quality products. Our friendly staff are always happy to help and if we don’t have something in stock we will do all that we can to get it for you. If you would like to get in touch then please use the variety of ways listed in the sidebar and like us on Facebook to keep up with all our latest offers.